I'm going to tell a legend to Karolina for return of her two stories. Base on her interests of postcard theme, I choose calligraphy art of traditional Chinese culture. This postcard is from National Taiwan University Faculties, Staff and Students Union Exhibition of Traditional Chinese Art. This year is the fourth time of the exhibition. 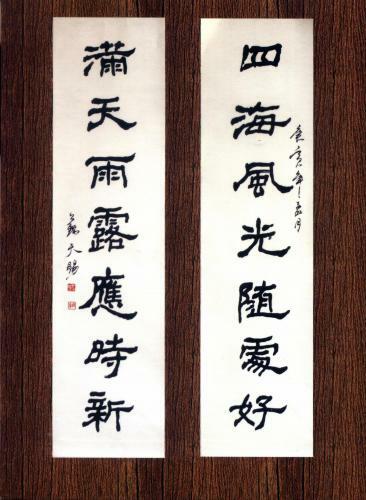 Traditional Chinese characters are truly treasures of east Asia. There are many races using them to write their spoken languages. Some races even have derivation characters for their own languages. 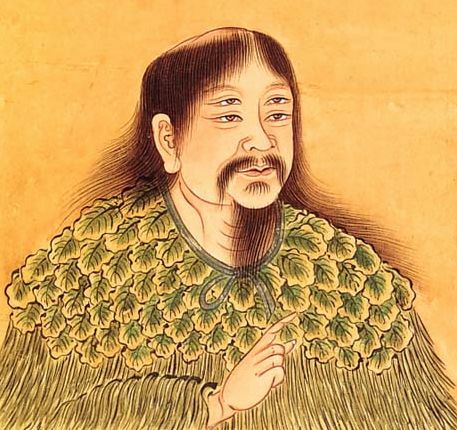 Cangjie, (pronounced like Ts'ang-chieh) was the saint who created Chinese characters. In the legends, he had four eyes and there are two pupils in each. This is usually one special feature of saints. He was the history keep officer of the Yellow Emperor. After unifying China, the Emperor needed to remember more things. So he was not satisfied with 'rope knot tying' method, and asked Cangjie to solve this problem. One day, Cangjie thought of this issue along the riverside. A phoenix flew by and dropped a stick with one animal footprint. While He was wonder what animal made the print, a hunter walked by and told him, 'I can recognise all animals by their footprints'. The idea came into Cangjie's mind. Yes, he could use lines to record everything's feature stroke by stroke. According to a history book, after he created characters, it rained millet from the heaven and ghosts cried at late night. It is because the nature could not hide its secret and the ghosts could not transform freely. People can write to record and describe. The Chinese characters transformed several times. The fonts we use nowadays are similar with the ones our ancestors used 2,000 years ago. However, mainland China simplified characters in 1950's and now uses different fonts from Taiwan. We Chinese Taiwanese now still use traditional Chinese while Chinese in China use non-traditional. The scenery of the country is good everywhere. The rain and dew wash everything to a new look. 本片同時於官方交換活動中寄出。This postcard was also sent for postcrossing official card. 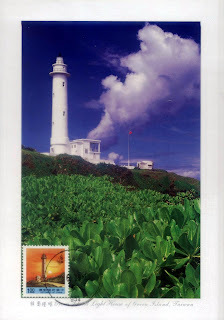 I prepared many postcards to send to friends who are interested in postcards from an outer isle of Taiwan. But after the trip, I think that I worried too much. Every shop selling scenery postcards only sells Mr. Hsu's work with no exception. The destination was kept in secret until the postcards arrived. My trip started on Wednesday, 16, a public holiday of Dragon Boat Festival. So all postcards were sent after Thursday. 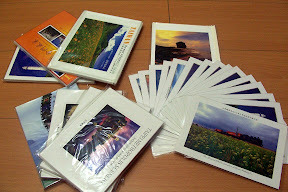 But what a surprise, some friends in Kaohsiung received the cards on Friday. How efficient!! The picture on the right is the Maximum Card I made. I also put on the scenic postmark on the back. The mark of Green Island is 'the pug and the sleeping beauty'. It does not match the stamp nor the postcard but It really one representative landscape of the island. Green Island was originally called Burning Island. It is located 33 km east of Taiwan in the Pacific Ocean; its land area is 16.2 km2. A submarine volcano created Green Island. Therefore, it is very mountainous, and its highest peak (281 m) is called Burning Mountain. Since this island is volcanic and corroded by wind and water, there are many breath-taking scenes, such as rocks and caves and a mystifying bay. Some of the most famous ones are: the sleeping Beauty, Cow Head Mountain, Sailing Ship Nose, and the Gate Rock. 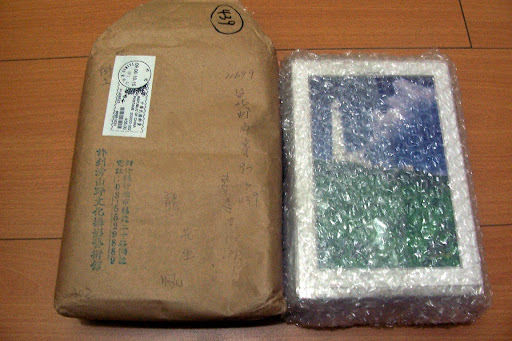 I have tried mail order, internet order, and some other non-shop sale. It was great fun to do those consuming activities. But I have never tried group order yet. In the middle of June, I'm going to travel to an outer isle of Taiwan. Although Taiwan is not a big country, traveling all over around is not easy, especially to outer isle. 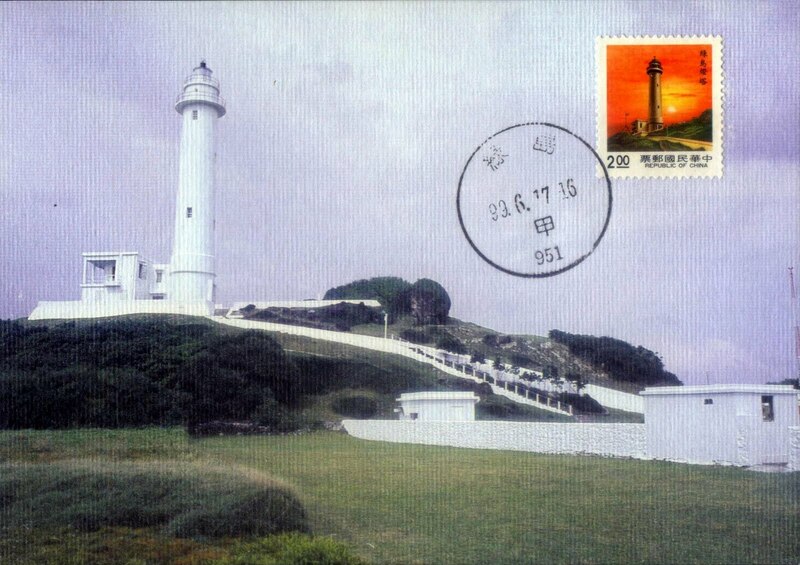 I have some stamps of the lighthouse on the destination and there is a post office on the isle providing a scenic postmark. I shall seize the chance and prepare some nice postcards for friends. 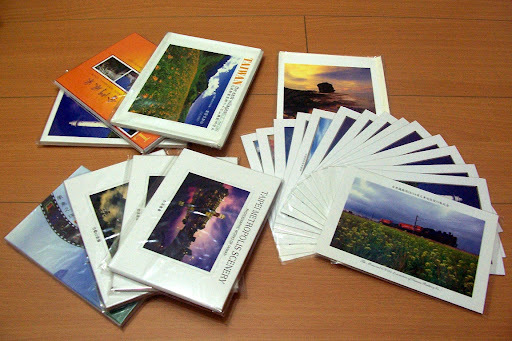 So, I ask A-j Deng and his friend to buy some postcards with me to share the shipment cost. One famous provider of Taiwan Image postcards is Chao-pang Hsu. He has a website: TaiwanImage. Here, you can check out his works and catalogue. 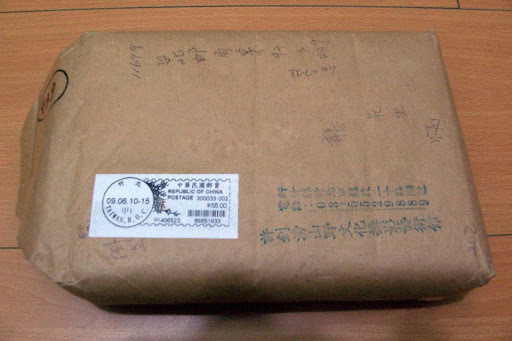 Email the item numbers and payment transfer receipt, you will get what you like. They only charge NT$30 for shipment. Order over NT$2,000 is free for shipment. After I emailed my order and transfered the payment by ATM on 8 June, I got a little parcel on 10 June. Look at those beautiful postcards and sets. Last month, I received a postcard of sailing from a Polish inland city. After I checked the Wikipedia, I found that it was the former capital of Poland and the European Capital of Culture for the year 2000. I appreciated the postcard so much not only because the theme I like but also the great job the sender had done. 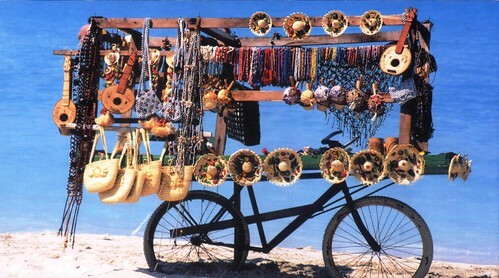 The sender, Karolina, tried to find the postcard to match my interests and showed me the culture by telling me a local legend. She was new to postcrossing, so she was keen to write me another postcard to tell me another story . Therefore, I got the second postcard and another story. Long time ago, there was a dragon living near King's castle. The dragon except for animals ate also young girls. King was afraid of his beloved daughter. He told to knights that the one who'll kill the dragon will receive beautiful princess as wife and half of the kingdom as reward. Many tried but dragon killed all of them. The poor shoemaker called 'Dratewka' made a sheep filled with sulphur. The dragon ate it and burned his throat. He tried to lessen pain and drank so much water from Vistula, Wisła in Polsih, River, that he splitted. Dratewka of course received his reward. 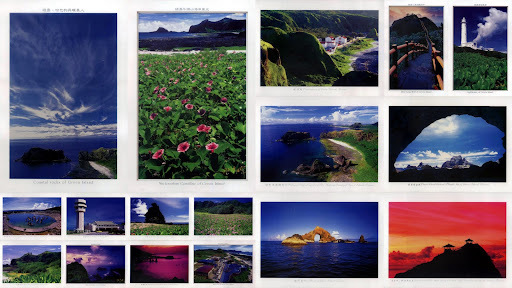 As what you may think, these are very very brief versions because the place of a postcard is so limited. Please use your imagination to expand the stories. Anyone who is interested in the second one, please look up the Wikipedia for more detail. 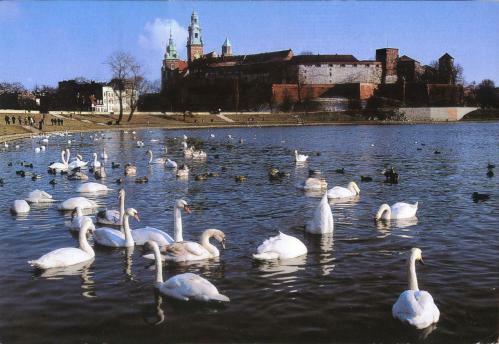 Those who want to check out the King's castle and the river, please check out another postcard at the bottom which I received from Poland before.